I am usually one to shy away from the more luxurious shops found in the Leeds Victorian Quarter, as I do find smaller and more high end shops to be quite intimidating. My inner gremlin whispers I don’t belong there and that my money won’t go far. Silly really, I can shop where I want, but I don’t think I’m alone with my insecurities and I often have the feeling that window shopping and browsing isn’t really “the done thing” in these kind of shops. 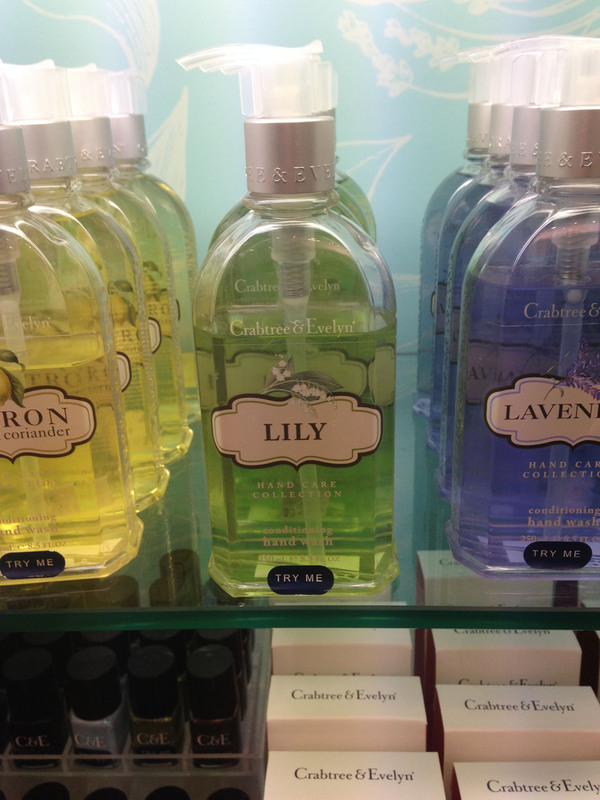 The staff in store helped me get over my misconception and introduced me to the wondrous world of Crabtree & Evelyn. To be honest, I did not think that this brand would be up my street, my aunt raved about it, but that was a little off putting for me. So, off I toddled into town and thought if anything I would get to meet some lovely bloggers. I’m so glad I went, I had a lovely time. 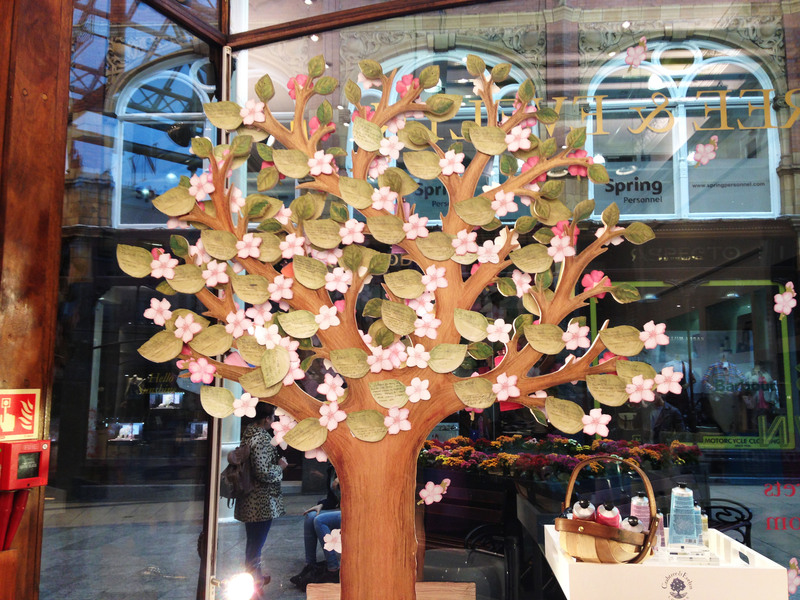 What struck me first was the lovely window display, that turned out to be a giant tree with paper leaves, with each leaf sharing a handed down tip. The store itself was clean, bright and beautifully decorated and my first impressions of the staff was that they were very approachable and friendly. It wasn’t too long before my hands found themselves wrapped around a chilled glass of prosecco and after waiting for the first blogger to make their move, I got stuck in to the fabulous nibbles. After only a few sips of prosecco, I was whisked over to the treatment area for a lovely hand treatment. I had the opportunity to choose a hand scrub to try and after discussing what scents I prefer, we decided on the Pomegranate Aragan & Grape Seed hand recovery scrub. Whenever I am in the position of being pampered, this could be; getting my hair done, a massage or even my nails painted, I get very sleepy and resemble a purring cat. Ingredients and benefits were being reeled off to me, but I was pretty lost in the fabulous massage and unable to take it all in (bad jenna!). All too soon the hand scrub treatment was over and my hand was looking brighter and feeling refreshed. We did pause before moving onto the other hand, so that we could compare the difference. Like a before and after scene/picture, there actually was a difference in appearance and how my skin felt. The next step in the treatment was to use a hand moisturiser. Again, I went for the pomegranate and sat back while the lovely assistant (is this the right word to use?) massaged my hands and nails. FYI; you can use the hand cream on your nails too, no need to buy a separate product unless you really want to. 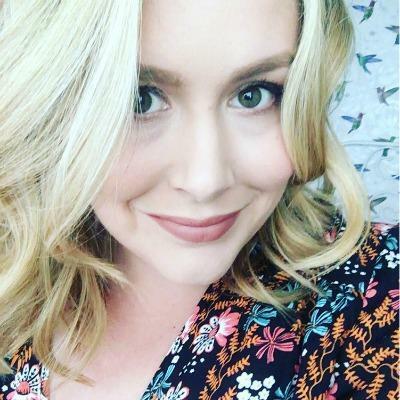 My hands felt lovely, soft and rejuvenated after the treatment and when I met up with my boyfriend after the event, he noticed the difference straightaway. Sometimes we can fool ourselves into believing that something has worked when it hasn’t, so to get clarification after holding hands (I’m a softy really) I was happy and glad I purchased the hand cream as a little treat. After the treatment and sharing my handed down tip (tip is at the end of the post) I was left to browse the store. This is when I came to realise it wasn’t all hand scrub and cream, it was so much more. I was surprised to see a range of vibrant nail polishes, a mens section (all be it small in comparison to the rest of the shop), perfumes, lotions and even food. You recall I mentioned nibbles somewhere up there. I purchased some hand cream for myself and some aftershave balm for my boyfriend , which turned out to be a good purchase for his birthday. The balm smelled amazing and he tried it out at the weekend and he really liked how it left his face feeling (So did I :)). So after treating myself, the BF and resisting the urge to buy everything in sight, I was gifted with a lovely Goodie bag. This was an unexpected surprise and a lovely way to introduce me further to Crabtre & Evelyn. I received a hand cream and a nail polish. The hand cream has overtaken hand food from Soap & Glory as my favourite and the quality of this polish is amazing. I got away with 7 days and only started to notice minor chipping by day 5. For someone typing away all day, it’s the stuff of dreams. 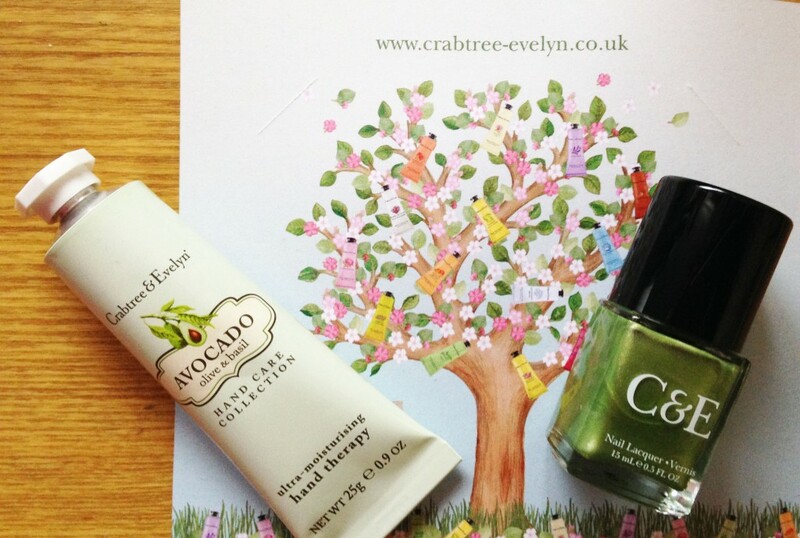 Have you tried anything from Crabtree & Evelyn? If so, what’s your favourite product? Oops! I almost forgot to share my tip. Handed down by both of my hands during afternoon tea, I was told that if I am to do anything at the end of the day, it should be to take the time to moisturise my face. Obvious to most, but still one I follow and stand by. Why wouldn’t I? Their skin looks amazing. What is your handed down tip? I don’t really have any handed down tips!